UM Rosenstiel School researchers study particles released into the atmosphere from the burning of fossil fuels to better predict future climate changes. MIAMI (July 17, 2017)—In a new study, scientists found that aerosol particles released into the atmosphere from the burning of fossil fuels are a primary driver of changes in rainfall patterns across the globe. The results of the climate system-model simulations conducted by researchers Brian Soden and Eui-Seok Chung from the University of Miami (UM) Rosenstiel School of Marine and Atmospheric Science revealed that changes in clouds, as a result of their interaction with these man-made aerosols in the atmosphere, are driving large-scale shifts in rainfall and temperature on Earth. A southward shift of the tropical rain belt is thought to be the leading cause of the severe drought conditions experienced in large portions of Africa and South America during the second half of the 20th century, which have caused significant impacts to local communities and water availability in these regions. Using multiple climate model projections, the researchers measured the effects man-made aerosols have had on rainfall changes in the 20th and 21st centuries to discover that when only greenhouse gases or natural climate forces are considered, climate models are not able to capture the southward shift of the tropical rain belt. 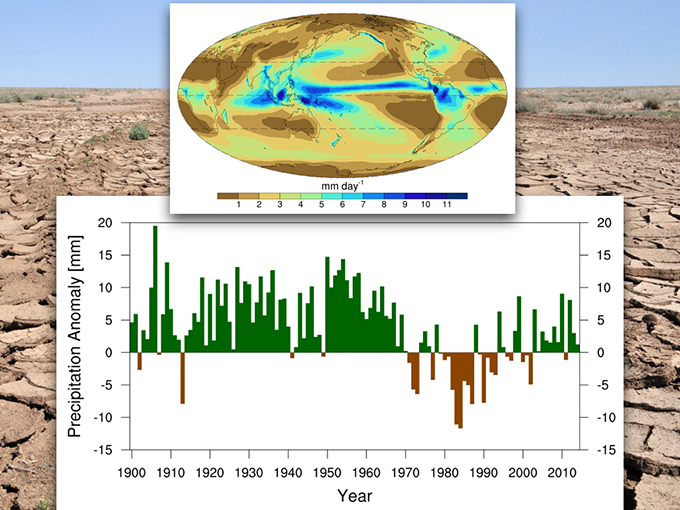 The analysis suggests that man-made aerosols are the primary driver of the observed southward shift in rainfall patters throughout the latter half of the 20th century. “Our analysis showed that interactions between aerosol particles and clouds have caused large-scale shifts in precipitation during the latter half of the 20th century, and will play a key role in regulating future shifts in tropical rainfall patterns,” said UM Rosenstiel School atmospheric scientist Chung, the lead author of the study. Changes in the radiative properties of clouds from the increase of these man-made particles in the atmosphere is resulting in large-scale changes in atmospheric circulation that drive regional climate and rainfall, says the researchers. The models the researchers used also found that the largest shift in rainfall patterns will occur over the tropics rather than in the mid-latitude northern hemisphere, the greatest source region of these man-made industrial aerosols. Understanding these aerosol-cloud interactions are necessary to better model future changes in tropical rainfall worldwide, said the researchers.